Securing your vehicle could be through having a fully functional garage. And one of its major and frequently used components is the garage door. These doors may be an expensive investment, however using right tools and spending some time with the know-how, you may build your own befitting garage door. For you to manufacture or order for a new garage door, you have to take proper measurements of the new garage doors. If ordering, give the structural opening and other measurements in metric. When measuring for a garage door, it is important to remember that most doors require some sort of frame to attach to. Another point to make is that the ordering sizes required by manufacturers can differ from each other. • You will need to provide the height and the width of the current brickwork. • The internal headroom available from the underside of the lintel going upwards to the nearest obstruction. • The available space on the internal reveals. • Attach the weather-stripping first at the first panel’s bottom-most edge. Then secure the panel cautiously in the doorway by driving the nails at such a position that they fix and lodge the door correctly. • Your next move is pretty easy. Simply follow your unique manufacturer’s instructions and gather all the needed pieces for various tracks (Horizontal, curved and vertical). • Install the entire the rollers as well as the supporting brackets where essential on the door section. Then slip in the vertical track on the rollers of the first section of the door. Do the same for other sides. • Now it is second section’s turn. Set up all the rollers into it and place the section in its place using helper and slip in the rollers onto the vertical tracks on both sides. • Now you can install the third part utilizing the above process. Check correct leveling of the door and plumb for the vertical door. For your safety, ensure at this point that every screws are in place and driven thoroughly. 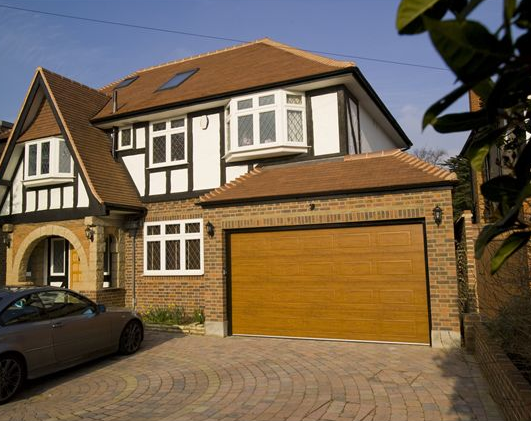 Due to its heavy build, garage doors tend to exercise significant force while it moves. Therefore watch out. • Now attach the jamb brackets with the tracks and attach the brackets to the framing members. Wait for modification of the tracks before tightening the lag screws. • Next, install the horizontal and curved tracks. Place the curved track in the process and bolt them together. • Check leveling of horizontal track. Now cutoff the back track hanger (sufficient to assist the track). Affix it to a blocking and methodically mount the track on it. Repeat the same for the remaining horizontal track. Finally once the door is finally installed, take further safety measures by testing the garage door functions on a monthly basis.